The journey began in 2012, October to be exact when Vishnu & Vinay came together and decided to open Sukh Sagar in Kilpauk. Today, Sukh Sagar is found all over the world, Mumbai, Bangalore, Mysore, Chennai, DUbao, KSA and Qatar as well. That is how popular this all veg chain restaurant is! 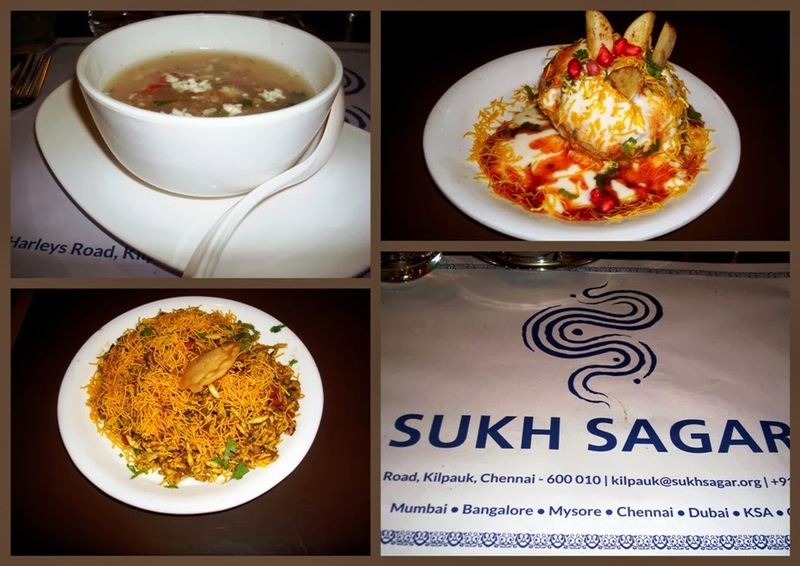 After the restaurant in Anna nagar shut, there was a brief gap of 2 years which is when they did all the ground work necessary to open their 1st Sukh Sagar in the city of Chennai. Vinay comes from an IT background, while Vishnu is quite familiar with the food industry, having worked as an Intern at Cream center. Now they are the proud owners of the outlet that can do 72 covers in the 1st floor Fine dining area, 60-70 people can stand and eat in the ground floor restaurant and then there is the Party/Banquet Hall that they let out for birthday parties and family gatherings. During the conversation we learnt that the place is packed to the brim on Saturday and Sunday [it was mostly Families that came regularly]. The entire Sukh Sagar brand is owned by Mr Suresh Poojani, who the duo knew through a common friend. The place where Sukh Sagar stands today is an old house, that was empty and that which presented the duo an opportunity to revolutionize the eating scene in that part of the city. Aside from the location, what worked to their benefit was the staff that came in from the Anna nagar outlet. They now have Chefs, 80 staff members who do double shift and who give them the confidence to do outdoor catering for upto 1000 people. The place is also let out for corporate functions and events, only condition being “veg food only”. 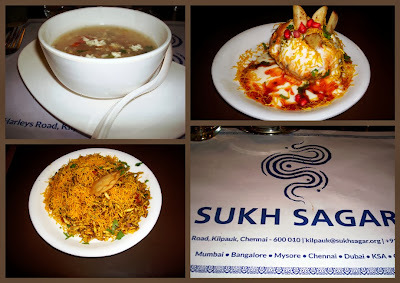 For now, they serve a range of North Indian & South Indian dishes, and might soon be making a few changes in their menu. They are also looking to introduce combo meals on a regular basis. And with that we settled in for the evening and looked forward to a good time.. The evening opened with soup- The Lung fung soup which was good, filled with flavour and tad spicy, perfect if you have a cold. Following that we had a chance to sample their chaat- Bhel puri and Raj Kachori both of which were absolutely smashing. Then came the starters- mushroom Chilli and the mixed veg platter that consisted of Corn seek kebab, Tandoori gobi, paneer tikka and hara bara kebab. Loved the gobi and seek kebab, others were good, but nothing wow! Between the conversations, we noticed the staff walk over to our table with plates of food, making us catch our breath. There was an assortment of Indian breads- Roti, butter naan, butter roti and plain naan. Even after a few minutes, the roti remained soft and beautiful. 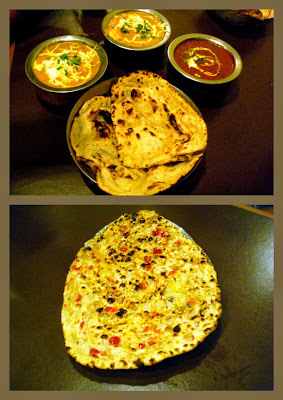 We also tried their kashmiri naan which was wow… The side dishes that followed suit were Paneer labadbar and dal makhani.. 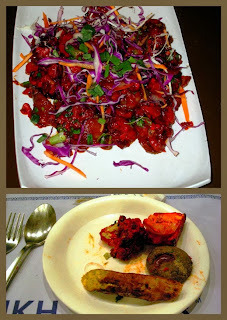 They were both perfect, not over the top masala filled or oily. While we were sampling the dishes, we felt thirsty and asked the guys to recco a drink. They promptly ordered Blossom for us, watermelon flavoured this drink is in a league of its own. You should try it the next time you are here to experience the beauty. And finally, we were nearly done!! Yayy. It was dessert time. We were quite full and so passed up on the Rice. 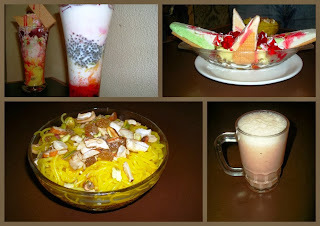 For dessert, we got to taste the Sukh Sagar Special, Malai Kulfi Falooda, royal Falooda and Gadbad ice cream. Each of these will have you grinning like a small child, and digging in happily with not a care in the world. Apart from these, they also have the regular kulfi and an assortment of ice cream sundaes. If you are looking for a place to have a quiet dinner, where food does all the talking, this is where you should head to. Wish them a very Happy 1stbirthday and many more years to come! !